QUINTE WEST – The City of Quinte West is being celebrated for going green. 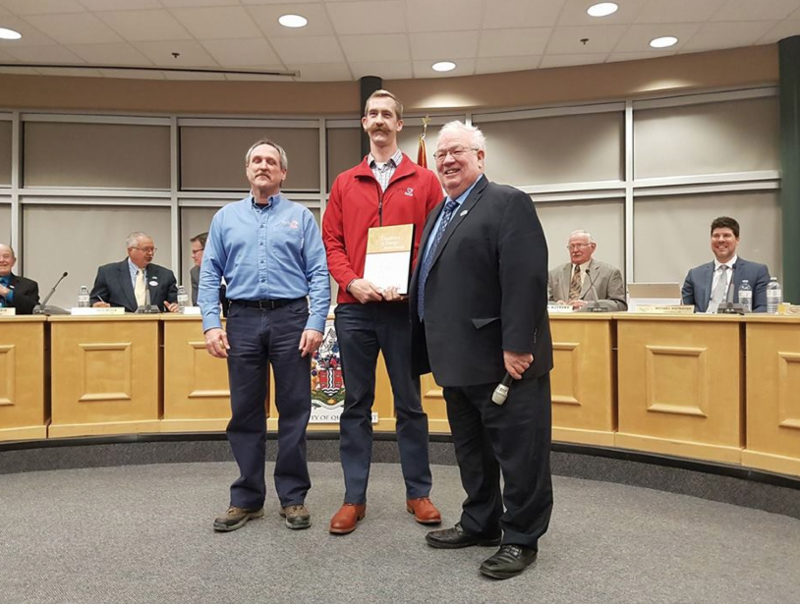 At Monday night’s council meeting, Mayor Jim Harrison received a plaque from John MacNaughton of Hydro One and David Gerrish of CLEAResult for the city’s efforts to conserve energy. CLEAResult is a company that helps individuals, businesses and communities find ways to reduce their energy consumption. In the last year, the city has saved over 968,151 kWh, which is equivalent to 100 homes being off the electrical grid. Projects like replacing high-pressure sodium streetlight bulbs with energy-efficient LED (light-emitting diode) lights in 2015 was an example Harrison provided to demonstrate the city’s efforts to go green. Upcoming projects include looking into different methods of lighting public buildings in and around the city. Coun. Duncan Armstrong said he is proud of the city’s efforts to conserve energy. “That shows how progressive we are and staying ahead of the game in terms of that technology,” he said. As for the LED lights, Armstrong said they have gotten nothing but positive reviews from residents of Quinte West. Armstrong said the city will continue its efforts to explore ways to save energy.